As of Jan. 1, 2016, the minimum wage throughout the state of California increased from $9 to $10.1 This increase, which will reportedly cost the state about $250 million, has been lauded by labor leaders and advocates, as well as by some lawmakers. In fact, Gov. Jerry Brown has remarked that lawmakers had a “moral responsibility” to increase the minimum wage to $10 in 2016 and, in doing so, help full-time minimum wage earners move another step away from poverty. Our bottom line is it should not be legal to pay a sub-poverty wage in California… [A minimum wage increase would] lift up poor Californians and reward all hardworking employees with the resources they need to put food on the table for their families. Although there are not currently any additional statewide minimum wage increases planned for the coming years in California, voters in the state may change that this November. That is because voters will have the chance to vote on two initiatives2, both proposing to increase the state minimum wage to $15 over the next few years. By 2018 in San Francisco. 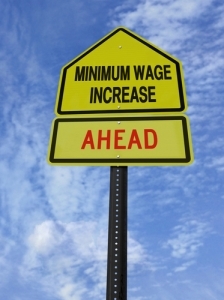 What do you think about the new minimum wage in California? Do you agree that increases to the California minimum wage should be annualized to match those planned for Los Angeles or San Francisco? Tell us what you think on Facebook & Google+. If your employer has failed to properly compensate you for your labor, contact a Sherman Oaks employment lawyer at Koron & Podolsky, LLP to find out more about your options for justice and financial recovery.